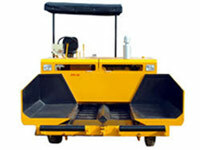 Our Asphalt Paver Finisher machine is primarily used for making Asphalt Roads. 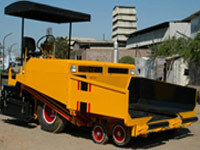 Our machines are predominantly useful in rapid finishing thus avoid traffic problems as per the M.O.R.T.H condition. The unique design & manufacturing of this machine using high grade raw material as well as latest technology, is the reason for immense demand of this machine in the international market. This Asphalt Paving Finisher machine has high applications in putting the asphalt on roads, bridges, parking lots and related fields. This machine sets the asphalt flat and compresses it before compacting it with the roller. 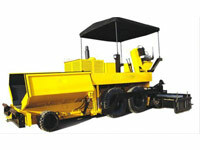 It is also applicable for mixing asphalt as well as wet mix paving. The chief feature of our machine comprises of sturdy construction, high operating speed with least noise output. The chases of this machine are designed to give strength and stability. The hydraulic jack of this machine facilitates uncomplicated & easy operations. These durable machines call for least maintenance. Most updated designs and characteristics of our machine have led to its immense demand not only in India but also in the international countries. Four steering bogey wheels of size 550 mm Diameter x 275 mm are mounted on equalized front axle. The Rear tyre 12.00 x 20 – 04 Nos. with equalizer beam guarantees excellent adherence even on the roughest surface. This machine has Hydrostatic transmission. Alterable displacement pump feeds the transmission system; it is fitted with a fix displacement motor connected to the gearbox. The Gearbox has 2-speed reduction and also has a Lock arrangement. All the gears are placed in the oil bath. The Two Hydraulic motors present autonomously control the two conveyors, thus has independent control of material on both the sides of the machine. The speed of conveyor is variable from 0 to maximum. Displacement sensors on discharge end of the conveyor aid in controlling the speed of the conveyor.